The award-winning PC MMORPG from China, “The Legend of Mir: Eternal”, arrives in Philippines and SEA neighboring countries. 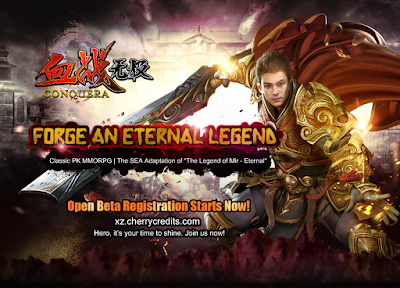 Singapore-based publisher Cherry Credits has announced that Open Beta pre-signups for its latest title, Conquera, have now begun across Southeast Asia. including Philippines. Players looking to get early access and exclusive in-game rewards can pre-sign up at xz.cherrycredits.com/en till December 3, 2017. Combining its Wuxia-style fantasy world with classic real-time isometric RPG gameplay reminiscent of Diablo and Neverwinter Nights, Conquera is an MMORPG in which the strong and ruthless triumph. The game is set in the richly historied continent of Maia, casting the player as one of the Dragonguard, an elite fighting force that must repel the orc armies of the tyrannical Lord Warmor. Players can craft their pendekar from one of three classes: The Warrior, Mage, and Priest, with more classes to be introduced via post-release content. All pendekar classes feature their own unique skill progression trees, along with customizable and upgradeable weapons and armor. The action takes place in a freely traversable Player-Kill-friendly world in which players can murder one another anywhere, anytime, with little consequence. Party-based play is hugely encouraged, as the game also features full-scale Guild Wars involving thousands of players at once. Additionally, a constantly evolving series of special in-game events ensures that players will always have new challenges awaiting them. Conquera was originally released as The Legend of Mir: Eternal in China to both critical and commercial acclaim, being selected by numerous gaming awards as one of the best Online PC Games of 2016. Its upcoming Southeast Asian release will feature English, Vietnamese and Mandarin localizations, along with dedicated community support from Cherry Credits. Players can join the Open Beta and participate in the community for exclusive in-game rewards at the official site and Facebook page. Watch Conquera Trailer Video entitled "Conquera – Forge Your Destiny!" Shanda Games is a leading Online Game developer, publisher and licensor. With over 2000 development and operations staff, over 70 released online games and 1.8 billion registered users, Shanda Games is committed to building a global interactive entertainment platform. In 2001, Shanda Games launched its flagship title Legend of Mir, sparking a new periode of online gaming in China. For over a decade, Shanda Games has been a key player in revolutionizing and innovating trends in the Chinese gaming industry. In the Mobile domain, Shanda Games has successfully published licensed titles such as Million Arthur, along with in-house developed titles such as Legend of Mir Mobile. It is the first gaming giant to switch its organizational strategy from online PC gaming to Mobile gaming. Simultaneously, Shanda Games' Intellectual Property (IP) initiative has given rise to successful cross-media releases, namely the first China Anime adaptation of the mobile game Bloodline, and a series of animated movies based on the well-known Dragon Nest IP; one of the first examples of a movie adapted from an online game. Currently, Shanda Games is actively promoting various AAA game IPs to be adapted to literature, anime, movies, variety shows and so on, creating a pan-entertainment ecosphere driven by the pulse of gaming. Cherry Credits is the leading game publisher and global payment service provider for digital content, wholly owned by Shanda Games International. Cherry Credits has published popular online and mobile games that include Dragon Nest, SD Gundam Capsule Fighter Online, Million Arthur and Bloodline. Offering a unique e-wallet system and physical scratch card distribution, Cherry Credits empowers gamers with the ability and convenience to purchase their game credits online anytime, anywhere. Overseeing millions of online transactions annually, Cherry Credits is recognized by game developers and publishers who have adopted our payment solution as an essential part of their global expansion plan.